This briefing paper for subcommittee members and staff outlined the major parts of S. 306 that would receive attention during the hearings to be held in Washington D.C. and Detroit, Michigan. The briefing paper outlined the subcommittee work plan and indicated the array of interest groups that appeared before the panel as it gathered information related to the administration of S. 306, its technical requirements, and the health challenges of air pollution. United States. Congress. Senate. Committee on Public Works. "Briefing Paper, Hearings on S. 306 Amending the Clean Air Act." 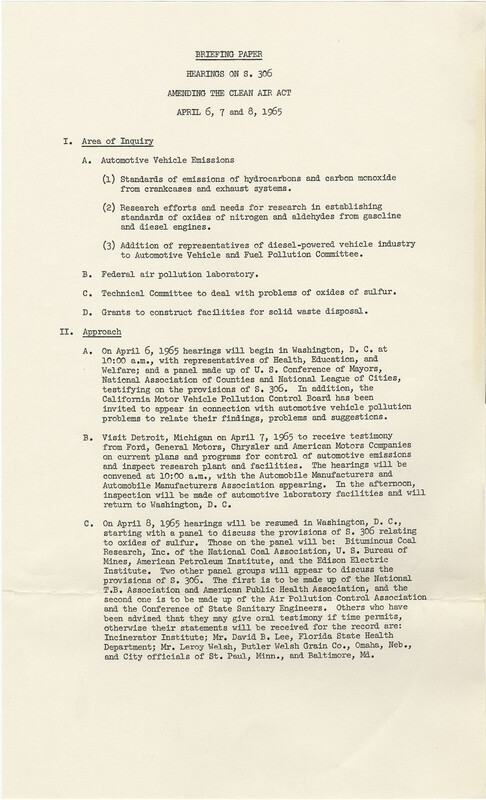 Briefing Paper, Hearings on S. 306 Amending the Clean Air Act, April 6, 7 and 8, 1965; “S. 306 Hearings—Clean Air Act amdts. April 6th & 9th (7th. Detroit)” folder, Legislative files, Box 3; Committee on Public Works; 89th Congress; Records of the U.S. Senate, RG 46; National Archives.. Accessed 19 April 2019. http://acsc.lib.udel.edu/items/show/323. Briefing Paper, Hearings on S. 306 Amending the Clean Air Act, April 6, 7 and 8, 1965; “S. 306 Hearings—Clean Air Act amdts. April 6th & 9th (7th. Detroit)” folder, Legislative files, Box 3; Committee on Public Works; 89th Congress; Records of the U.S. Senate, RG 46; National Archives.